After the move to Australia, I knew eventually I had to switch to new skincare products as well. It wasn't top on the priority list as I still had my stash with me. Plus, testing out new products while pregnant with the hormones and all may not be a good idea. Why do I need to switch to new skincare products, you might ask? I guess it's the realisation that I may need to have products that work well with the Aussie weather, as some of the products I've been accustomed to worked best in humid, tropical weather as in Singapore and Philippines. Some products that I've been using have been hard to find as well and if I do find them, are crazy expensive here. Being a complete stranger to most Australian and Kiwi products, I didn't really venture much until recently when I first stepped into Priceline. Because my skin needed much needed TLC, I was on the hunt for organic, natural and good products. And of course, there's the thing with my "choosy" nose as well. The product had to be light, mild-scented (or none at all) and natural. 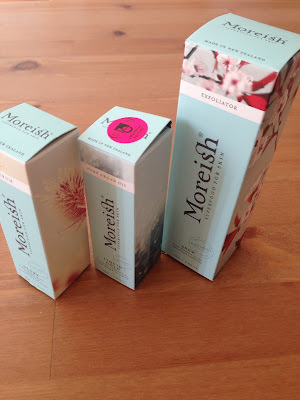 I bumped into the Moreish product range during my hunt - and to be honest, what got me was the packaging. The dreamy, muted colours of nature in the side panels, and the pale blue was so spot on - it was sooo me! :)) Unboxing wasn't a disappointment, either. The products came in sleek names too, and nice yet functional bottles. It felt like the products were well-thought of, from the packaging down to the containers - I love that it was in hygienic dispensers/bottles. So far, upon using the products, I didn't get any break-outs which is usually what happens when trying new products. I guess this is primarily because the of organic and natural ingredients the products are made of. 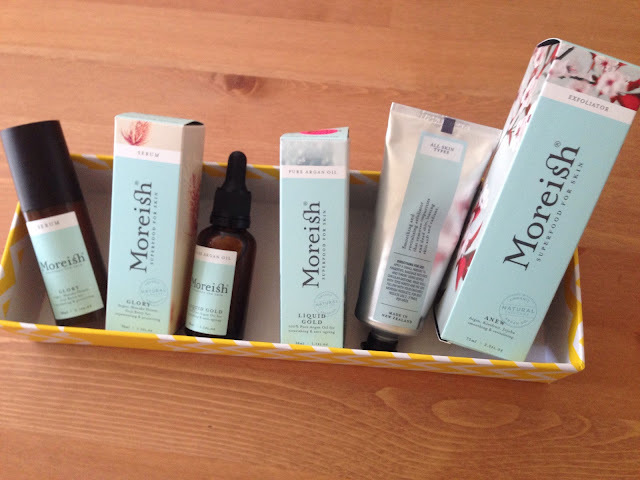 The organic, New-Zealand based company exclusively sells their product line in Priceline. And so far, based from what I've tried, so good. I like how small the microbeads are, perfect for regular use, not too rough like other exfoliators I have tried. The serum comes in a light citrus smell and it lingers. Not too strong, just a delicate hint of citrus. It makes me feel nice and fresh. I apply a thin film after cleansing before moisturising with argan oil. I have to admit that the product does live up to its name, it hydrates and plumps up the skin. Marketed as 100% pure argan oil, I was excited to try this product especially I was on the hunt for argan oil products to try. The texture is a bit heavier compared to the other product I was accustomed to, but it is certainly a big help especially during these cold months. A little drop goes a long way of this product goes a long way. I don't have any complaints, it moisturises and that is saying something when it's winter. (I've found that the best test of a moisturiser is when it still does its job during winter when everything is so drying and humid). 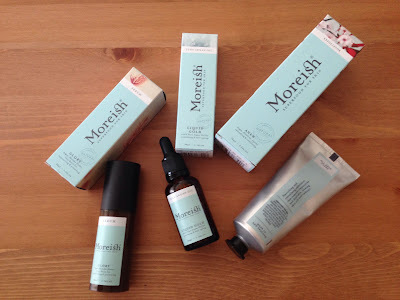 I am trying to build up the skin care arsenal as well, and with the experience I had with the Moreish range, I wouldn't mind adding a few more products from the line to try.